Submit your Tier 7 and 8 Platoon Challenge #3 replays here! Join Random battles while in a 3-person platoon during the event period. All platoon members must have destroyed at least 1 enemy tank during the game. Players in the platoon will be limited to any combination of Tier 7 and 8 tanks only. Submit the link to your replay to this thread. Deadline of entry submission is on 30 January 2015 at 14:00 (UTC+8). 700 gold each (1 winning platoon)* = Destroyed the most number of enemy tanks. * If the platoon managed to destroy all 15 enemy tanks, their prize will be increased to 1,400 gold and 7 days premium service! 300 gold each (3 winning platoons) = Randomly drawn from qualified entries. In the event that there are platoons tied for the highest number of tanks destroyed, the one who submitted his/her entry first will receive the prize. 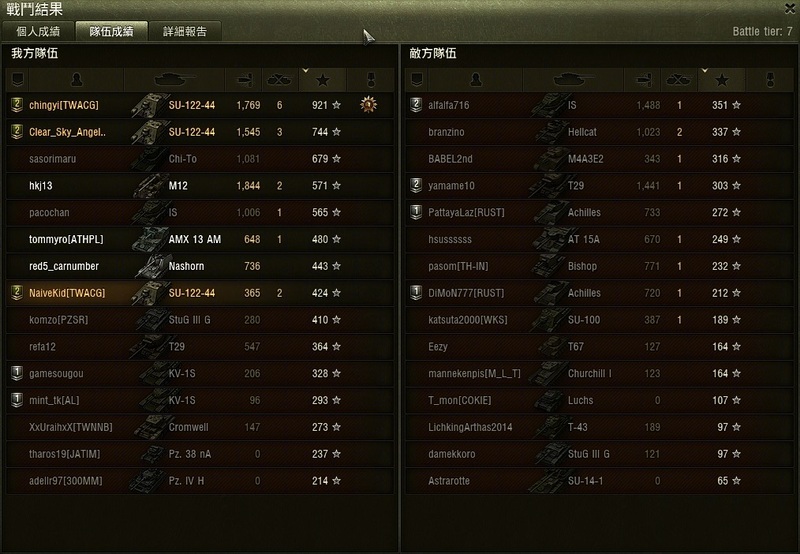 Current leaders are NaiveKid, Clear_Sky_Angel, and chingyi with 11 total tanks destroyed!